" Not flesh of my flesh, nor bone of bone, but still miraculously my own. Never forget for a single minute: You didn't grow under my heart but in it. " Welcome to Compassionate Hearts, a non-profit 501(c)(3) orphan relief organization and adoption agency. Compassionate Hearts Adoption Agency brings substantial expertise and experience to serve your adoption needs. The agency grew out of a humanitarian relief work for orphans and orphanages, and now we do Montana homestudies to place children into good homes. 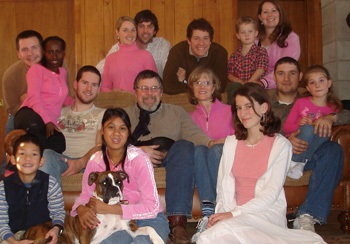 The main office for the adoption agency is located and licensed in the state of Montana. Cyndi Peck is the director of the Montana office. The mother of five biological and four adopted children, Cyndi began her professional work with adoptions in 1998. She has worked with international adoptions in nine countries and has also placed children for domestic adoption. Pictured here are Cyndi, center, with her husband, their children, children's spouses, and two grandchildren. Compassionate Hearts has and continues to participate in fund-raisers for the purpose of helping children in many countries including Guatemala, Cambodia, and Haiti.